No, the image to the left is not a newly discovered picture of Jane Austen. The image was taken from my copy of The Complete Letter Writer, published in 1840, well after Jane Austen’s death in 1817. But letter writing manuals were popular throughout Jane Austen’s lifetime, and the text of my copy is very similar to that of much earlier editions of the book, published from the mid-1750s on. It is possible then that Jane Austen might have had access to one. Letter writing manuals contained “familiar letters on the most common occasions in life”, and showed examples of what a letter might look like to people who needed to learn the art of letter writing. The Complete Letter Writer also contains an English grammar, with rules of spelling, a list of punctuation marks and an account of the eight parts of speech. If Jane Austen had possessed a copy, she might have had access to this feature as well. But I doubt if she did. Her father owned an extensive library, and Austen was an avid reader. But in genteel families such as hers letter writing skills were usually handed down within the family. 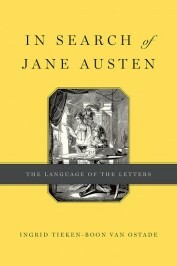 “I have now attained the true art of letter-writing, which we are always told, is to express on paper what one would say to the same person by word of mouth,” Jane Austen wrote to her sister Cassandra on 3 January 1801, adding, “I have been talking to you almost as fast as I could the whole of this letter.” But I don’t think George Austen’s library contained any English grammars either. He did teach boys at home, to prepare them for further education, but he taught them Latin, not English. So Jane Austen didn’t learn to write from a book; she learnt to write just by practicing, from a very early age on. Her Juvenilia, a fascinating collection of stories and tales she wrote from around the age of twelve onward, have survived, in her own hand, as evidence of how she developed into an author. Her letters, too, illustrate this. She is believed to have written some 3,000 letters, only about 160 of which have survived, most of them addressed to Cassandra. 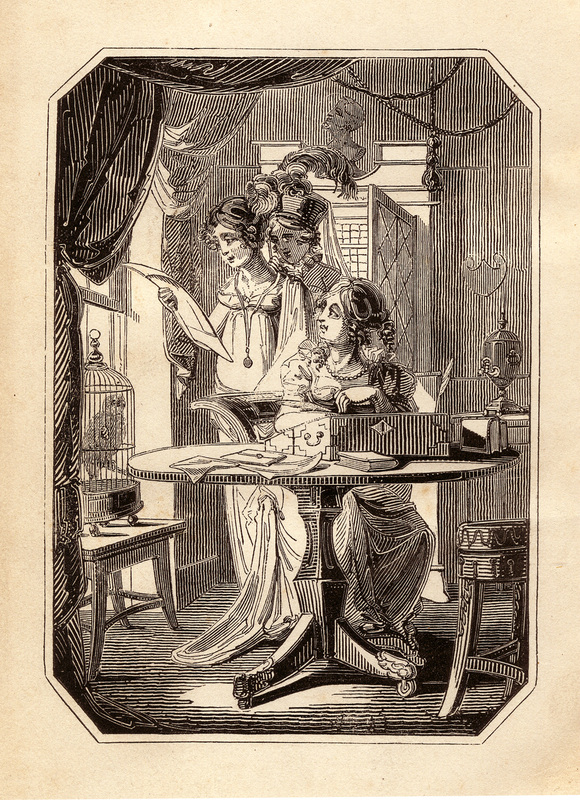 The first letter that has come down to us reads a little awkwardly: it has no opening formula, contains flat adverbs – “We were so terrible good as to take James in our carriage”, which she would later employ to characterize her so-called “vulgar” characters – and even has an unusual conclusion: “yours ever J.A.”. Could this have been her first letter? Cassandra wasn’t the only one she corresponded with. There are letters to her brothers, to friends, to her nieces and nephews as well as to her publishers and some of her literary admirers, with whom she slowly developed a slightly more intimate relationship. There is even a letter to Charles Haden, the handsome apothecary who she is believed to have been in love with. Her unusual ending, “Good bye”, suggests a kind of flirting on paper. The language of the letters shows how she varied her style depending on who she was writing to. She would use the word fun, considered a “low” word at the time, only to the younger generation of Austens. Jane Austen loved linguistic jokes, as shown by the reverse letter to her niece Cassandra Esten: “Ym raed Yssac, I hsiw uoy a yppah wen raey”, and she recorded her little nephew George’s inability to pronounce his own name: “I flatter myself that itty Dordy will not forget me at least under a week”. It’s easy to see how the letters are a linguistic goldmine. They show us how she loved to talk to relatives and friends and how much she missed her sister when they were apart. They show us how she, like most people in those days, depended on the post for news about friends and family, how a new day wasn’t complete without the arrival of a letter. At a linguistic level, the letters show us a careful speller, even if she had different spelling preferences from what was general practice at the time, and someone who was able to adapt her language, word use and grammar alike, to the addressee. 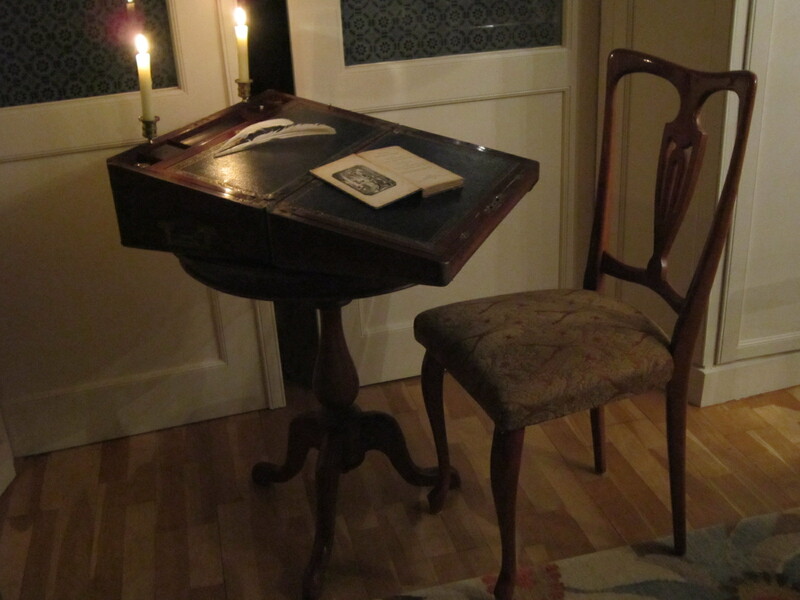 All her writing, letters as well as her fiction, was done at a writing desk, just like the one on the table on the image from the Complete Letter Writer, and just like my own. A present from her father on her nineteenth birthday, the desk, along with the letters written upon it, is on display as one of the “Treasures of the British Library”. The portable desk traveled with her wherever she went. “It was discovered that my writing and dressing boxes had been by accident put into a chaise which was just packing off as we came in,” she wrote on 24 October 1798. A near disaster, for “in my writing-box was all my worldly wealth, 7l”. Image credits: (1) Image of Jane Austen from The Complete Letter Writer, public domain via Ingrid Tieken-Boon van Ostade (2) Photo of writing desk, Ingrid Tieken-Boon van Ostade. Such an insighftul and enjoyable post about Jane Austen. I especially love the photo of her writing desk! The reason that only 160 of Jane Austen’s letters survive out of the 3000 she wrote is that the rest were deliberately destroyed by the Austen family in the 19th century. This was done to disguise the fact that the novels of Jane Austen were in fact written by her highly educated cousin, Eliza de Feuillide. Eliza could not publish them under her own name as she was the illegitimate daughter of the Governor General of India. The Austen family in the 19th century for the same reason destroyed all of the letters of Eliza de Feuillide. However, luckily a few survive because they were written to a distant cousin. All of these letters of Eliza’s can be read in Deirdre le Faye’s book “Jane Austen’s Outlandish Cousin”. The beautiful elegant and witty style of these letters can be seen to be the same as the elegant style of the novels.